Margo Gottlieb, Ph.D., is the co-founder and lead developer for WIDA at the Wisconsin Center for Education Research, University of Wisconsin–Madison. She is also the former director of assessment and evaluation at the Illinois Resource Center. Starting her career as an ESL and bilingual teacher, Gottlieb has worked with governments, states, school districts, international schools, publishers, universities, and organizations. Over the last decade she has focused on designing English language development standards, assessment systems, and curricular frameworks. She has extensive publications, including close to 100 articles, monographs, chapters, and books. Her books address language proficiency standards, academic language use, assessment and accountability, common language assessment, and assessment of English language learners. Her most recent text (with M. Castro) is Language Power: Key Uses for Accessing Content (2017). Dr. Diep Nguyen is an associate professor and chair of the Department of Teacher Education at Northeastern Illinois University in Chicago. Prior to coming to NEIU, she served as the assistant superintendent of curriculum and instruction in two Illinois school districts. Dr. Nguyen was also the director for bilingual/multicultural programs in Schaumburg School District 54, where she instituted dual language programs in Spanish/English and Japanese/English. Dr. Nguyen received her Ph.D. in educational studies from the Ohio State University. She has an M.A. in French literature and a B.S. in foreign language education. Her areas of interest include second language development and programming, assessment and curriculum development, and multilingual/multicultural education. She serves on the Illinois State Advisory Council on Bilingual Education. 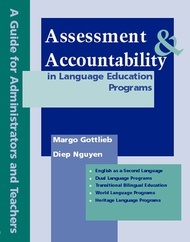 She is also the coauthor, with Dr. Margo Gottlieb, of Assessment and Accountability in Language Education Programs.